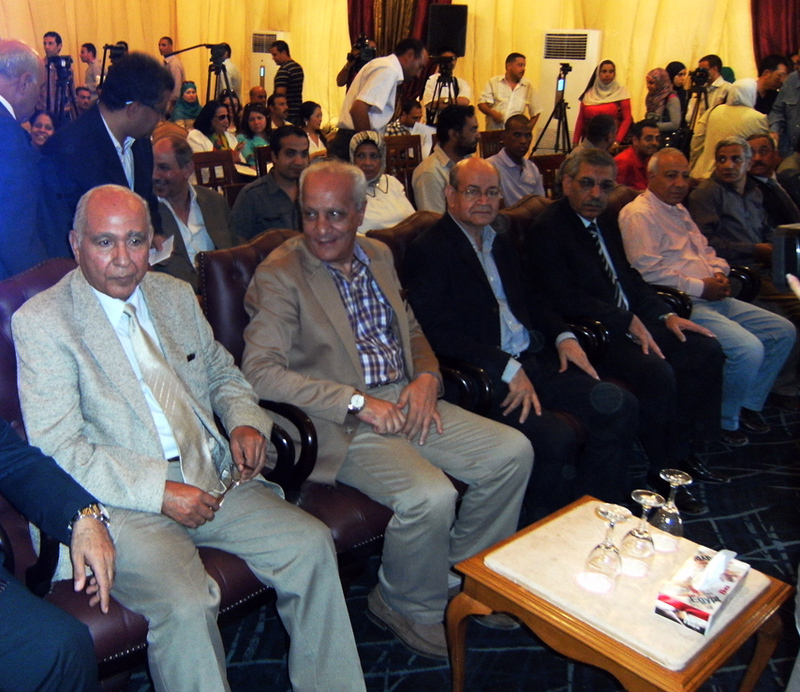 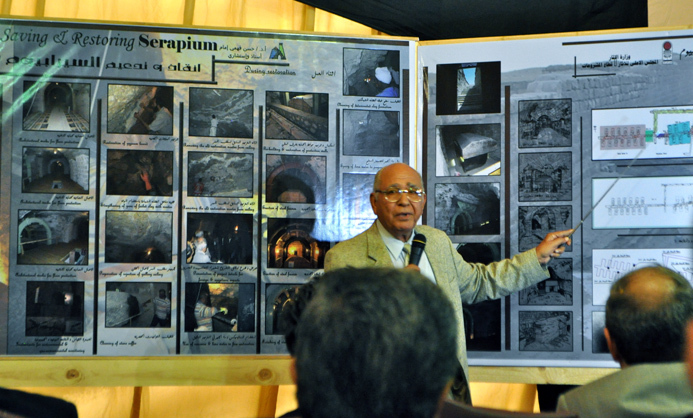 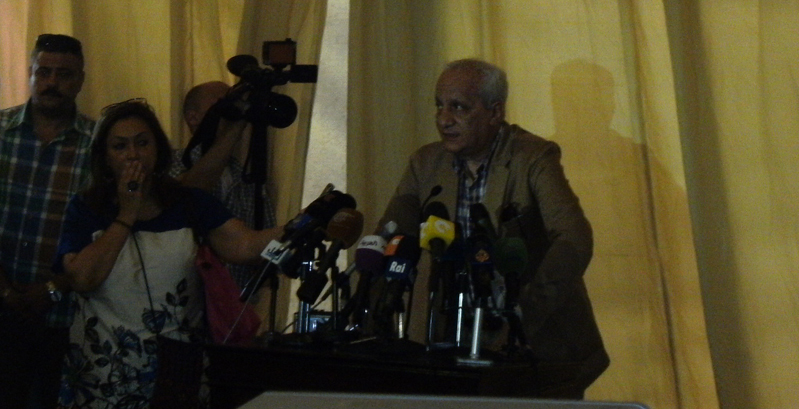 A large crowd was at Sakkara necropolis on Thursday 20th of September for the international press conference which was called for by Dr. Mohamed Ibrahim, Minister State of Antiquities to witness the inauguration of the Serapeum and the re-opening of two old kingdom tombs after restoration (Petahotep and Mereruka). 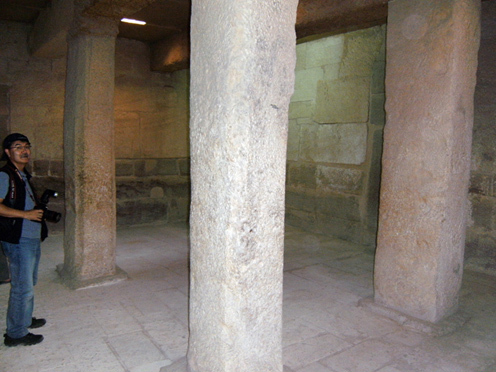 It is catacombs of the sacred Apis-bulls (1500-30BC), from the 18th Dynasty until the Greco-Roman period. 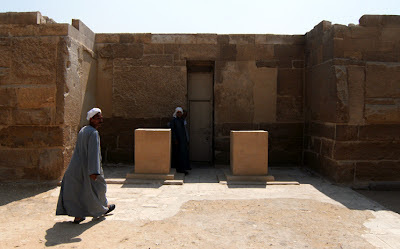 In August 1850, Auguste Mariette was sent on a scientific mission to Egypt to document and list Coptic manuscripts in Alexandria and at some stage he had to come to Cairo to get permission from the Patriarch of the Coptic Church. 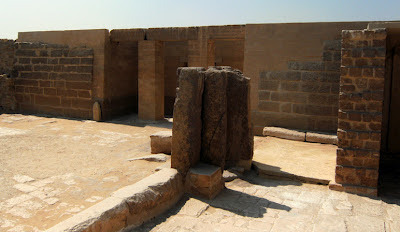 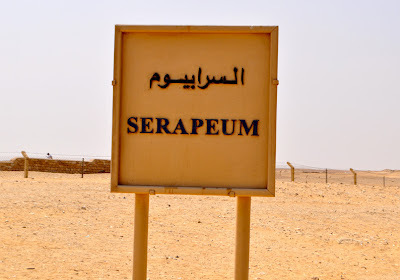 After seeing few statues of Sphinxes in different aristocrats houses and asked about where it came from, the repeated answer “ Sakkara” made me decided to take an exploration trip on which he found his first discovery was an avenue of human-headed sphinxes, which led him to the entrance of the Serapeum. Mariette’s exploration of the Serapeum and surroundings lasted four years. 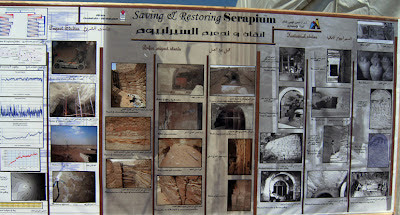 Over the course of this period, four successive campaigns were carried out. The first lasted from the 19th of November 1851, to the 15th of February 1852 and allowed for the clearing of the “Greater Tunnels”; which contained the remains of the sacred Apis bulls slaughtered between the 52nd year of Pasmmetic I’s rule and the end of the Greco-Roman period. 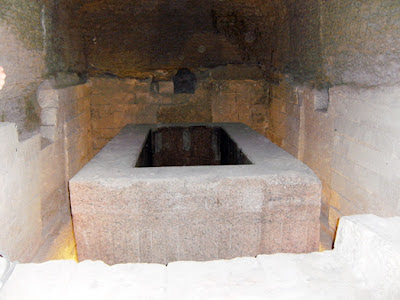 The second campaign, which took place from the 15th of February to the 15th of March 1852, allowed for the exploration of the “Lesser Tunnels”; where the Apis bulls after the 30th year of Ramses II’s reign, up to the 21st year of Pasmmetic I were buried. 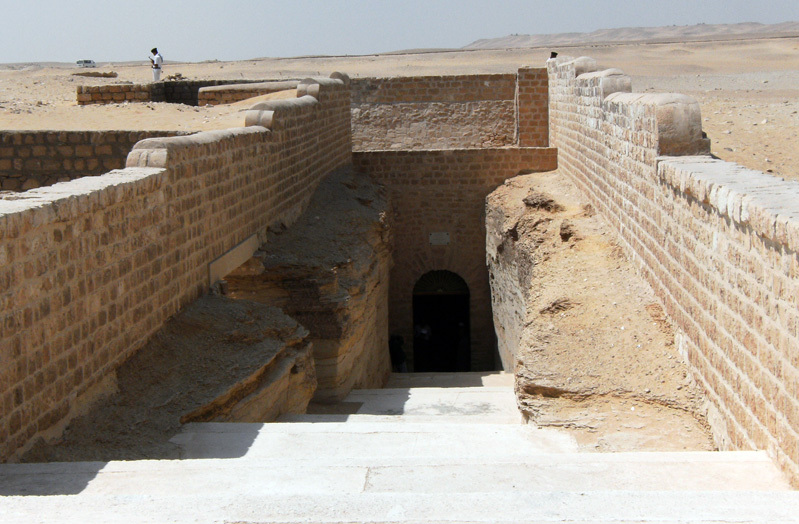 During the third campaign, (15th March till 15th of September 1852) Mariette discovered the isolated tombs of the Apis bulls from the end of the 18th Dynasty to those from the beginning of the 19th Dynasty. 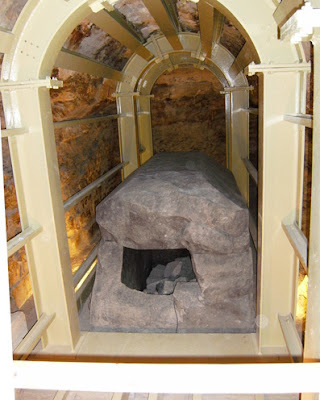 The fourth and last season, (15th of September 1852 till 24th of September 1852) Mariette extended his investigations to study the materials used to construct the monuments he excavated as well as their surroundings. 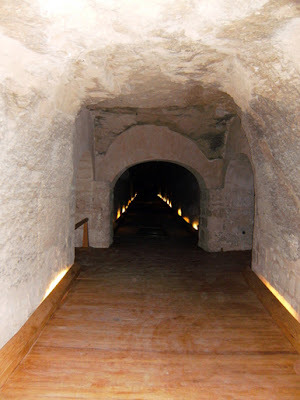 The Serapeum main tunnel is 150 meters long, 3 meters wide and an average height of 5 meters. 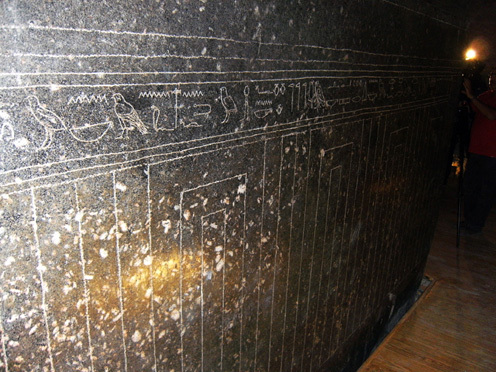 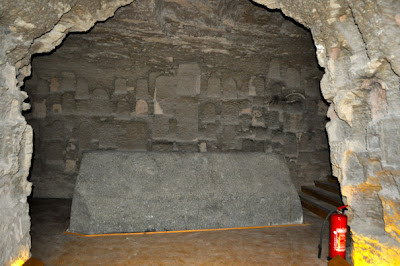 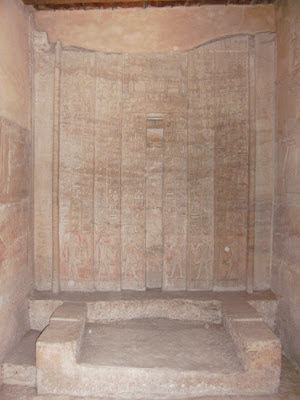 There are 24 sarcophagus of either Gray-pink granite or basalt, only 3 of them bares hieroglyphic inscriptions on them. 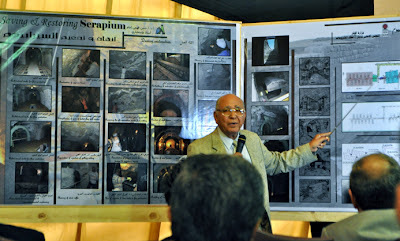 After Dr. Mohamed Ibrahim speech, Dr. Hassan Fahmi Emam, engineering Professor at Cairo University, who is the project consultant talked about the early stages of the project since 1985 when the threat of collapsing of the Serapeum was recognised and a committee was formed to discuss the best way to deal with the situation amongst was the current MSA Dr. Mohamed Ibrahim. The frustration and passion was so clear during Dr. Hassan talk about the project and the debate that took years between the archaeologists and engineers on how to deal with the situation and whether or not to use steel scaffolding and bars to support the ceiling of the tomb. 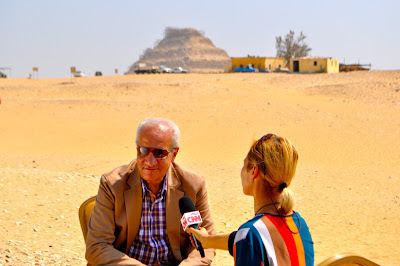 According to Dr. Hassan Fahim, it took three times to get back to UNESCO experts for advice which they supported the engineers’ opinion to use to steel scaffolding and the actual work started in 2001 and was finished in December 2010 at a cost of 12 and half million pounds but the tomb was still closed because of the political situation in Egypt. 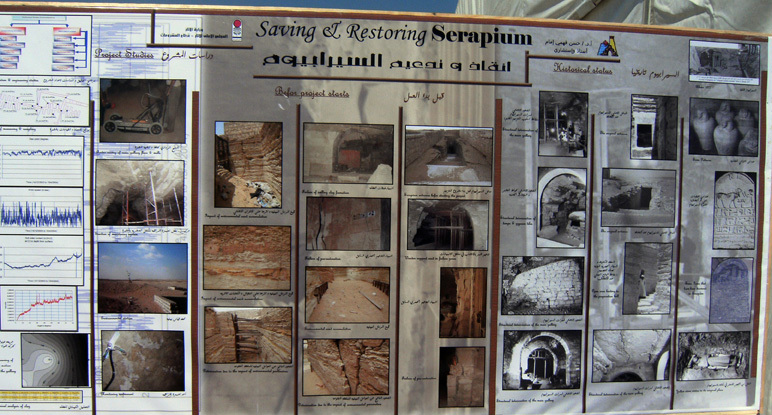 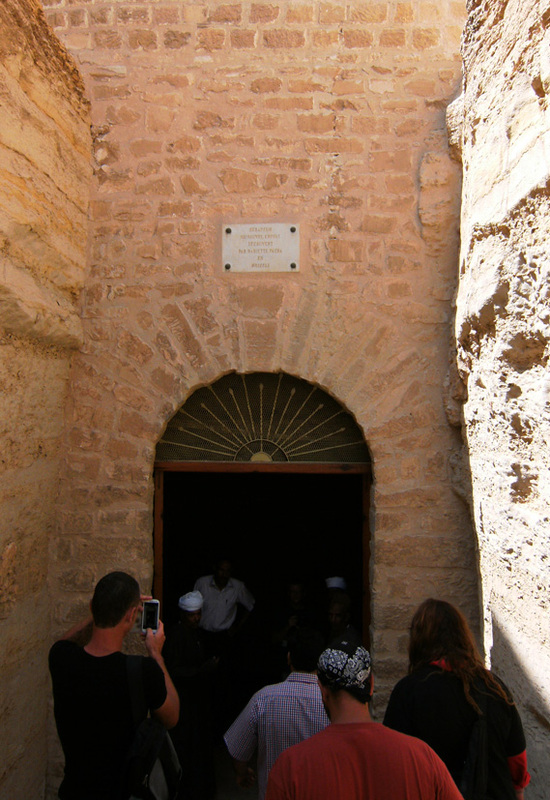 Then all the international media representatives were invited to visit the Serapeum and the two re-opened tombs. 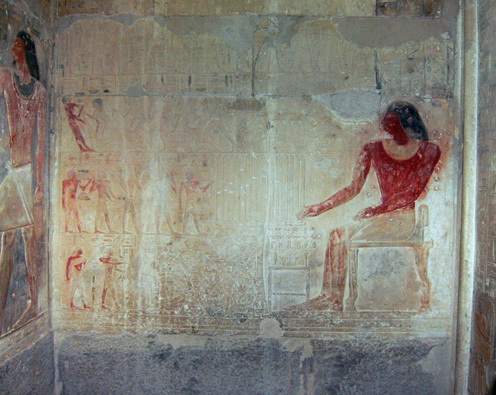 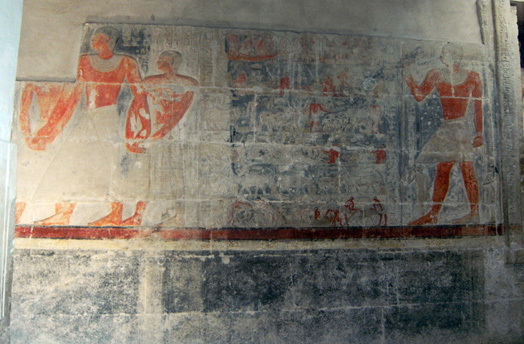 Tomb of Ptahotep and his son Akhethotep. 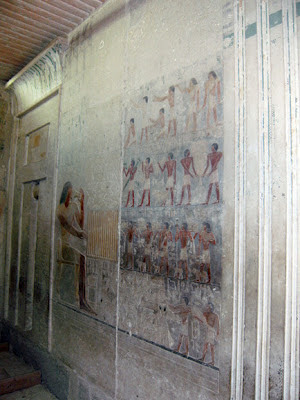 High officials of the second half of 5th Dynasty. 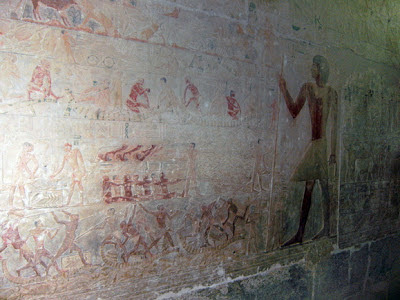 It was discovered by the French Egyptologist Auguste Mariette in the 1850s and documented by Norman de Garis in 1898. 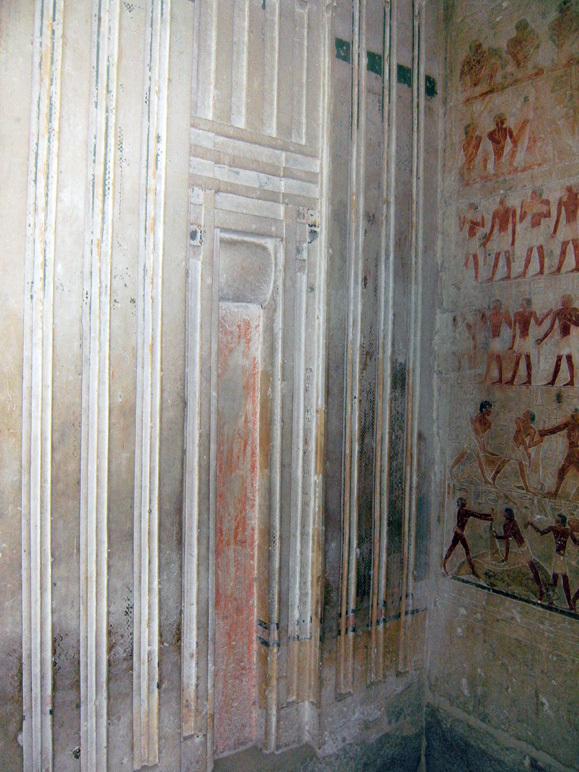 After more than 4400 years, the architecture of the tomb is almost completely treated and the coulours of its beautifully decorated interior are well preserved. 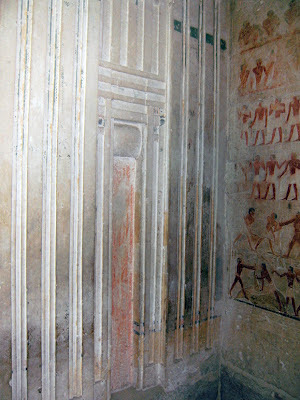 The decoration of the tom was not all finished as seen in the room just after the entrance. - Mechanical cleaning for the birds’ crap on the false door at the front courtyard. 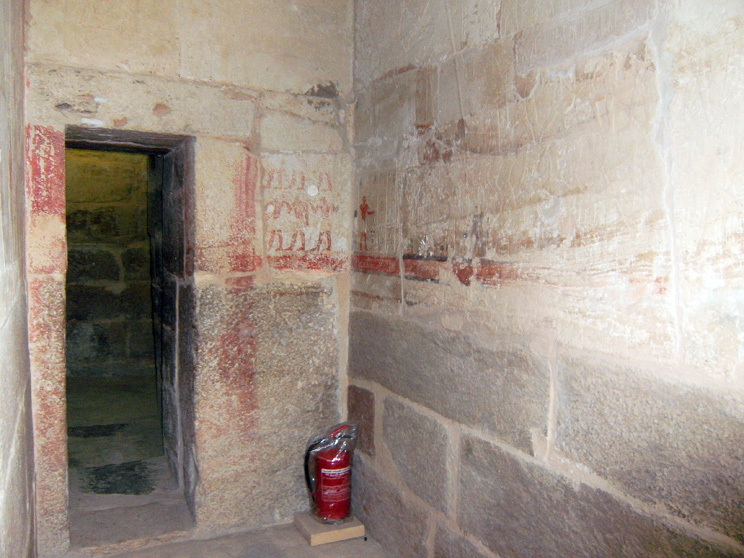 - Cleaning work of the tomb façade using the right chemicals. 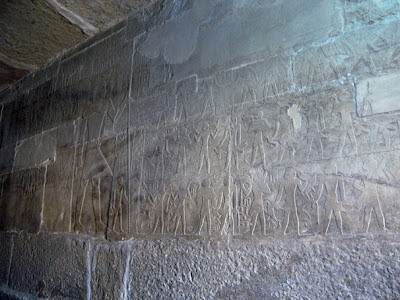 - Strengthen the lime stones. 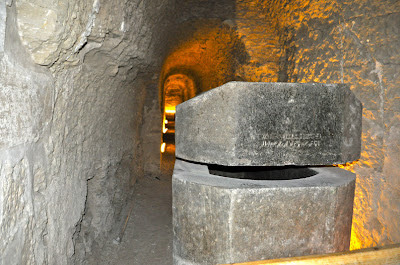 - Removing salts of the stones. - Strengthen and confirming the faded colours in the tomb. - Adjusting the ventilation and lights in the tomb. - Adjusting the windows in the tomb by filling the holes around them. 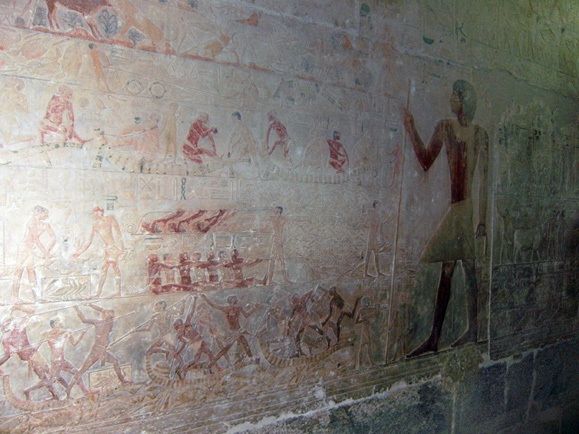 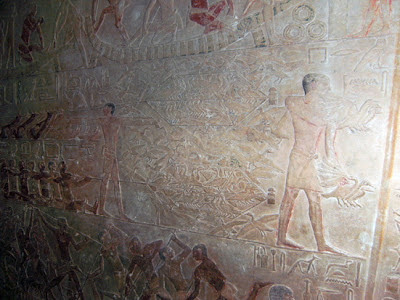 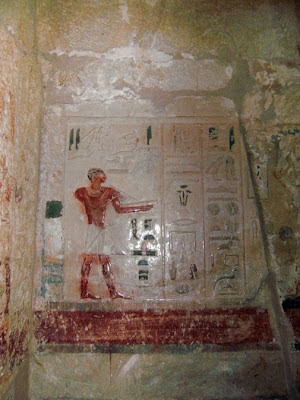 The tomb of Mereruka is one of the largest and most complete of all the non-royal tombs in Sakkara. 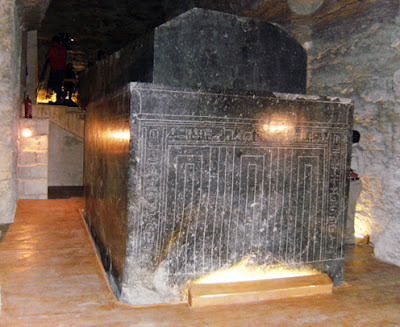 It was built at the beginning of the 6th Dynasty. 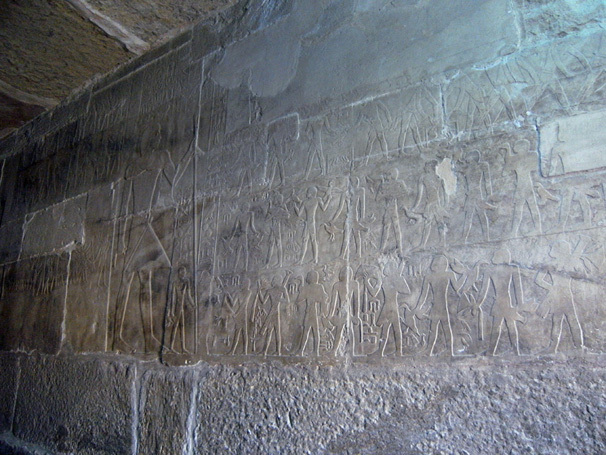 According to the Greek sources from the 3rd century B.C, he lived in troubled times, during which King Teti was assassinated by his bodyguard. 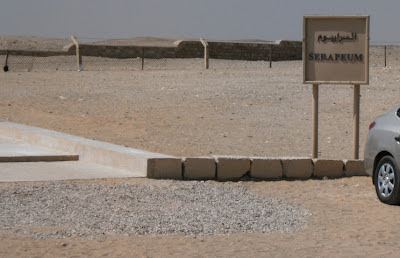 The sudden vacant place of the ruler is believed to have been temporarily occupied by Mereruka, who was married to the King’s daughter, Princess Seshseshet, until a legitimate royal succession was established. The tomb was discovered by the French scholar Jaques de Morgan in 1893. 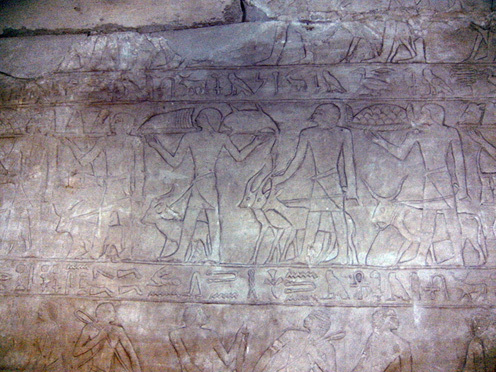 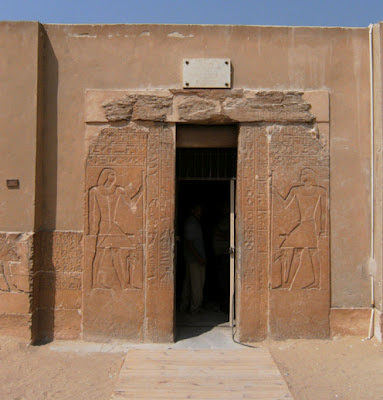 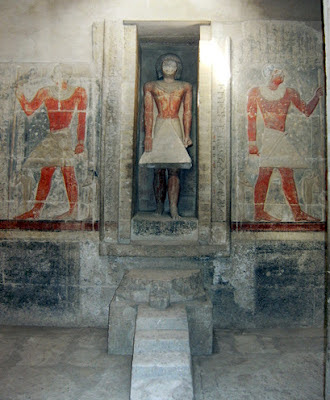 The tomb of Mereruka includes the burial places of his wife Seshseshet and their son Meryteti. 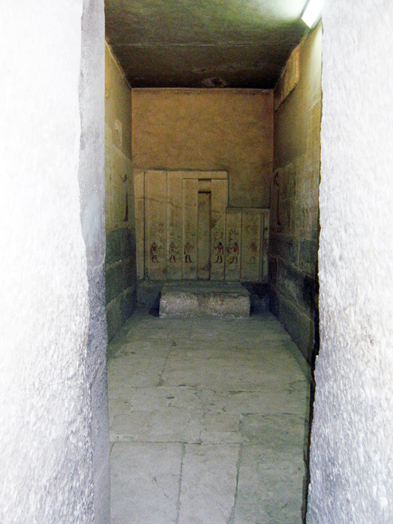 Though the coulours of the tomb have vanished, the burial room of Mereruka is still considered one of the most beautifully decorated funeral chambers of a high official at Sakkara. 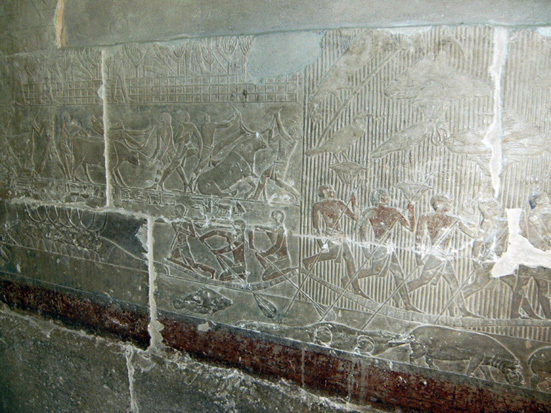 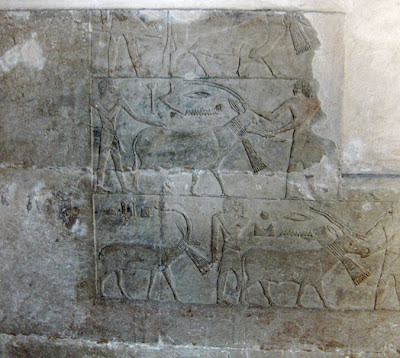 The tomb contains vibrant and well preserved decoration, with a rich variety of daily scenes; scenes of agriculture, fishing, hunting, jewellery making and the rendering of justice and punishment among others. - Mechanical cleaning of the dust. 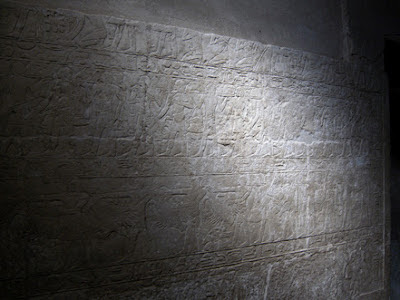 - Chemical cleaning of the walls especially caused through touching the walls especially at the entrance. 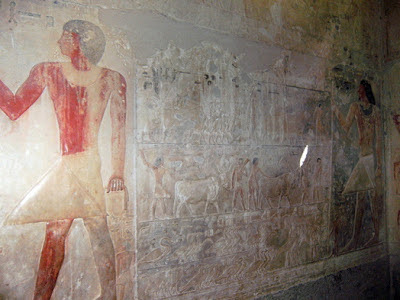 - Strengthen and confirming the faded colours on some walls. 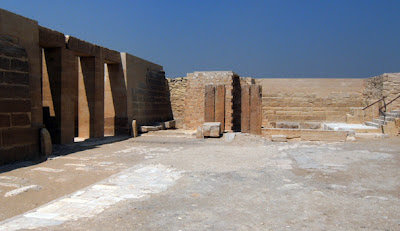 - Completing some parts of the flooring using limestone with plaster. 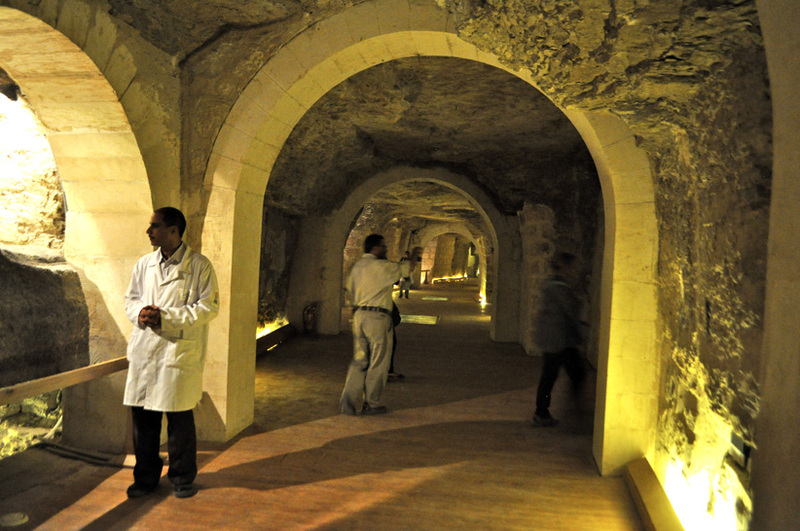 - Installing temperature and humidity check devices and to interfere if necessary using the suitable tools such as humidity sucking devices. - Improving the ventilation inside the tomb by using the natural ventilation from the windows. 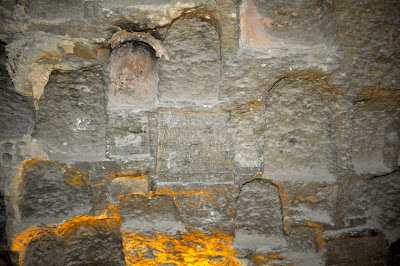 - Adjusting the lighting system to match the tomb needs. 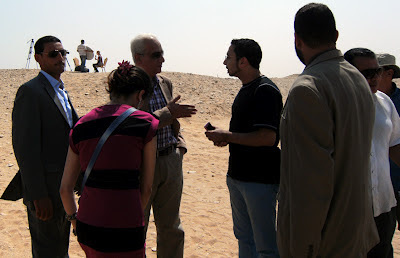 for their assistance and help to make this day happen.